Stored in climate-controlled building and the condition really shows! “It Just Feels Right,” was Mazda’s TV advertising tagline during the late 1980s and early 1990s. MotoeXotica Classic Cars would like you to just feel right in this 1989 Mazda RX-7 Convertible. Made in Mazda’s Hiroshima, Japan factory, this amazing low mileage example spent years in a climate-controlled building and the condition really proves that extra care on this RX7! This has to be one of the nicest example RX7 FC for sale on the market today! Finished in correct Blaze Red (code SQ), the car’s paint and trim are in overall excellent condition. The windshield looks nearly flawless, the car’s lights are clear and intact especially the attractive Series 5 only rear taillights and also its bodywork is straight. The two-seater’s engine bay is extremely tidy and still appears show room new, its cargo area is in excellent condition and the body-colored bumpers look great. The convertible was designed to enhance cold-weather cruising. The top has three positions – open, closed or Targa-style. Behind the seats is a windblocker device designed to keep air from funneling into the cockpit from the rear. The windblocker is hinged and was claimed to reduce wind noise and air turbulence at speed. The car comes with a high-output heater, too. This RX-7 rolls on Bridgestone Potenza RE910 tires, size 205/60R15 at all four corners. Each one is mounted on a silver factory BBS basket weave wheels. Under the hood is Mazda’s 13B (code S5 FC) Rotary motor, a 1.3L unit. The high revving butter smooth cylinder-less motor is connected to one of Mazda’s slick-shifting five-speed manual transmissions. Inside, the black leather (code FD8) seats are in excellent condition and come complete with a pair of speakers in each headrest. The matching black carpet is in similar condition to the seats. The three-spoke steering wheel looks great, as does the instrument panel with its rotary control dials and orange graphics. The inner door panels are in similar condition, as is the shift lever. A Pioneer AM/FM stereo with CD player completes the interior but is not currently powering on. Mazda introduced a convertible version of the RX-7 in 1988 with a naturally aspirated engine — introduced to the US market with ads featuring actor James Garner, at the time featured in many Mazda television advertisements. The convertible featured a removable rigid section over the passengers and a folding textile rear section with heatable rear glass window. Power operated, lowering the top required unlatching two header catches, power lowering the top, exiting the car (or reaching over to the right side latch), and folding down the rigid section manually. Mazda introduced with the convertible the first integral windblocker, a rigid panel that folded up from behind the passenger seats to block unwanted drafts from reaching the passengers — thereby extending the driving season for the car in open mode. The convertible also featured optional headrest mounted audio speakers and a folding leather snap-fastened tonneau cover. The convertible assembly was precisely engineered and manufactured and dropped into the ready body assembly as a complete unit — a first in convertible production. Handling was much improved, with less of the oversteer tendencies of the FB. The rear end design was vastly improved from the FB\'s live rear axle to a more modern, Independent Rear Suspension (rear axle). Steering was more precise, with rack and pinion steering replacing the old recirculating ball steering of the FB. Disc brakes also became standard, with some models (S4: Sport, GXL, GTU, Turbo II, Convertible; S5: GXL, GTUs, Turbo, Convertible) offering four-piston front brakes. The rear seats were optional in some models of the FC RX-7 but are not commonly found in the American Market. Mazda also introduced Dynamic Tracking Suspension System (DTSS) in the 2nd generation RX-7. The revised independent rear suspension incorporated special toe control hubs which were capable of introducing a limited degree of passive rear steering under cornering loads. The DTSS worked by allowing a slight amount of toe-out under normal driving conditions but induced slight toe-in under heavier cornering loads at around 0.5 Gs or more; toe-out in the rear allows for a more responsive rotation of the rear, but toe-in allowed for a more stable rear under heavier cornering. Mazda also introduced Auto Adjusting Suspension (AAS) in the 2nd generation RX-7. The system changed damping characteristics according to the road and driving conditions. The system compensated for camber changes and provided anti-dive and anti-squat effects. 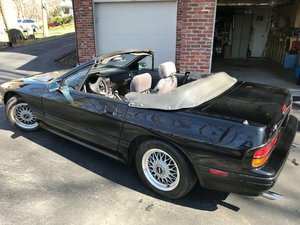 Competition to this RX-7 droptop in 1989 included BMW’s 325i Cabriolet, Buick’s Reatta, Cadillac’s Allanté, Chevrolet’s Camaro and Corvette convertibles, Chrysler’s LeBaron Convertible, Ford’s Mustang Convertible, Jaguar’s XJ-S Convertible, Mazda’s own RX-5, Mercedes-Benz’s 300 SL Convertible, Nissan’s 300ZX Convertible and Pontiac’s Firebird Convertible. If you want a machine to take you back to the those less hectic days before marriage, kids and a mortgage, or if you always wanted the chance to pilot a car with a rotary engine, stop on by MotoeXotica Classic Cars to check out this well-preserved survivor from the Decade of Excess! This car is currently located at our facility in St. Louis, Missouri. Current mileage on the odometer shows 22,955 miles. It is sold as is, where is, on a clean and clear, actual mileage Indiana title. GET OUT AND DRIVE!!! PLEASE CLICK HERE TO VIEW OUR YOUTUBE VIDEO!